Quaker American, LLC has acquired the rights to open the first in a series of Quaker Steak & Lube restaurants in the Tampa, Florida area. Quaker Steak & Lube is a successful casual dining, theme restaurant franchise with a particular focus on automobile, motorcycle, auto racing, and service station décor. MelCap Partners acted as the investment banker and financial advisor to develop the most favorable capital structure for the Company, and arranged and negotiated the requisite capital to fund the acquisition. 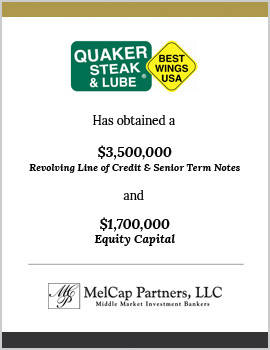 MelCap Partners, LLC successfully represented Quaker American, LLC to fund the acquisition and opening of the restaurant with $1,700,000 of equity and $3,500,000 in the form of a revolving line of credit and senior term loan.